PanARMENIAN.Net - With the support of Business Armenia, 32 Armenian companies will participate in the international exhibition of food and beverage ProdExpo in Moscow, Russia on February 11-15. 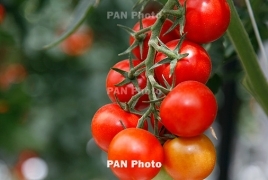 Last year, 21 Armenian companies returned from the same expedition with export contracts of AMD 5.7 billion. The Armenian producers will be presenting large international buyers and distributors with a wide range of products: semi-manufactured goods, fruit, vegetable, fish and meat preserves, jams, fruit vodka, brandy, liqueur, gin, wine, dairy products, cheese, dried fruits, chocolate, beer, coffee, tea, pasta, melted butter, etc. "Taking into account the results of the exhibition and the interest of the manufacturers in the exhibition, Business Armenia has increased the number of companies participating in the international exhibition this year. 32 manufacturers will represent their production, instead of 21, and the unified space will occupy 207 square meters, instead of 181 square meters," said Markus Azadian, Export Team Leader at Business Armenia.